Newly built in 2015, a three bedroom bungalow with a fenced garden to the rear and a large shed to the side, also a two bedroom bungalow which is currently rented out and 25 acres of croft land. The new bungalow benefits from uPVC double glazing throughout and the heating system is an air sourced under floor wet system which is further enhanced by a multi fuel burner to the lounge. Accommodation comprises lounge, kitchen/diner, utility room, sun room, three bedrooms (one with ensuite) and bathroom. Accessed by its own private driveway there is a fenced garden to the rear. There is 25 acres of croft land, 11 acres of rough grazing with trees and 14 acres of arable/grazing. There is also a two bedroom bungalow with attached garage which is of non-traditional construction and would benefit from upgrading, it currently has a tenant. The large shed to the side of the bungalow measures approximately 109 square meters. 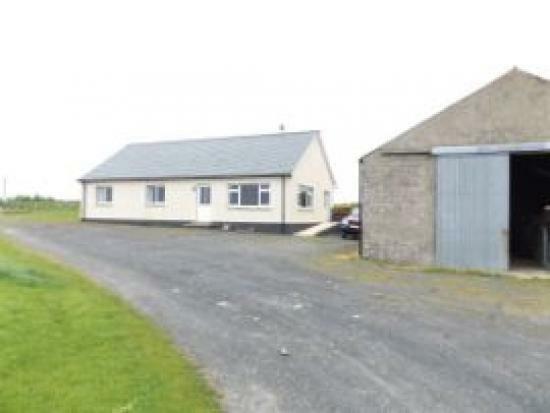 With two houses, a shed and land, not only is this ideal for the keen equestrian but it also has the potential to be used for a variety of purposes. Viewing is recommended.